Where else on public radio programming can you hear polar bears growl, peregrine falcons cry and killer whales splash? In an ever increasingly urban world, Encounters: Experiences in the North brings the sounds of the northern wild to the radio for a rare, entertaining and informative weekly program. 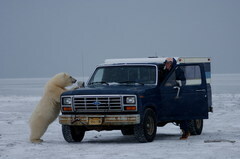 Now in its fifth season, Encounters is heard throughout Alaska and around the nation. Alaska’s acclaimed cultural anthropologist and award winning nature writer, Richard Nelson and seasoned NPR senior correspondent Elizabeth Arnold host Encounters. Each 29- minute segment contains a tight weave of scientific and indigenous perspectives as Nelson bubbles over with boundless enthusiasm for all things wild. Because it is recorded live to tape, Encounters has a refreshing immediacy that makes for exciting and entertaining listening. I want to be alone.... in the wilderness! Why do we love wild sounds? and what makes them worth saving? The tide waits for no man, even when that man is waiting fo for the tide!